#GEN2012: Will we still have digital development editors in 10 years? 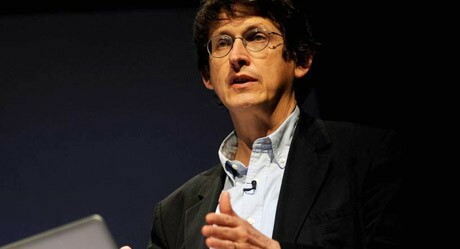 Newspaper publishers need to “keep looking outwards” and make changes – even the titles that are the most digitally advanced – the Guardian’s digital development editor told editors at the World News Summit in Paris today. I’d like to hope that in the future it’s something that every journalist would play a role in and would start to understand and have an interest and curiosity in how they connect with readers in meaningful ways. I still think there is a need to be honest and open with ourselves that this is not a communication revolution that is going to slow down any time soon. If that means we have to have a role that is constantly looking outwards at how our readers are changing, I think there is always going to be a need for this. The Guardian has a very unique culture, specifically about embracing new ideas and understanding new platforms and seek opportunities from new tools. When you see journalists work closely with developers, what’s great is watching both sides learn what’s possible. For anyone who’s working on internal change it’s so easy to become internal looking and focused on internal structures and politics. My own bit of advice would be to keep looking outwards. 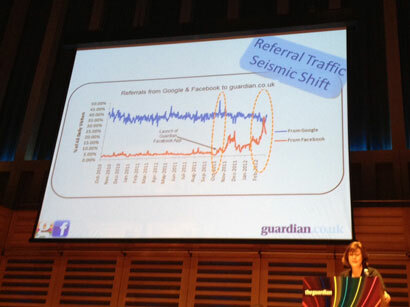 Guardian network editor Clare Margetson said there were still some journalists who needed a hand getting to grips with digital. When I was on the newsdesk 10 years ago it seemed like a very different place. One of our best reporters would sit smoking a pipe and would not touch a computer. He would call in his story. It seems a world away. There are still some who need help and some for whom Facebook is still quite a scary thing to use, but it’s quite collaborative and you find the younger reporters on a bank of desks will help out the older ones. This entry was posted in Journalism, Multimedia and tagged #gen2012, Global Editors Network, News World Summit, The Guardian on May 31, 2012 by Paul McNally. The Guardian has announced it is to disclose the full details of who paid for journalists’ transport, accommodation and other expenses at the bottom of travel articles. The new policy has arisen following a recent complaint from a reader about an article in which the reporter’s expenses were covered by environmental campaign group Greenpeace. I think that in many circumstances it is fine to accept trips funded by governments, NGOs or lobby groups, though in all cases we should declare them at end of the piece. All funded trips should be authorised by a senior editor and the judgment we should make is, ‘What would the reader, armed with the information about how the trip was funded, make of it?’ If the answer to that is that the reader would probably consider it dodgy, or somehow contaminating of our coverage, then we shouldn’t take it. The Guardian is going to take a step further towards openness in the area of travel writing. In future, travel features will specify which aspects of a trip were paid for and by whom at the end of such features. Across the rest of the paper, on each desk, there are plans to log any trips taken, to ensure that such trips are tracked and signed off by a senior editor. 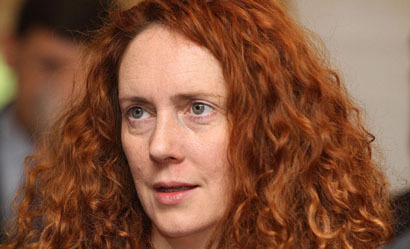 This entry was posted in Journalism and tagged ethics, guardian, The Guardian, Travel on April 16, 2012 by Paul McNally. 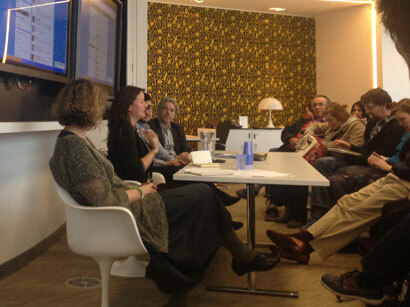 A community of commentators provides the Guardian storytelling process with “cross-fertilisation from below the line”, David Shariatmadari, deputy editor of Comment is Free (CiF), the Guardian’s comment, analysis and discussion platform, told readers at the Guardian Open Weekend event today. In a session called “digital revolution: how publishing is becoming collaborative”, Shariatmadari explained how 400 non-Guardian staff are commissioned to contribute to CiF every month. In addition to commissioned commentators, a post-moderated commenting system, and reposting content from niche blogs, the “opening processes” provided by social media results in “unearthing unexpected gems from the readership”. “It’s difficult to say where the future of digital collaboration might go next,” Shariatmadari said, but feels “moderation will always be necessary”. The Guardian trys to reduce the need by moderators by “managing the conversation”, with journalists, community coordinators and moderators joining the debate. Laura Oliver, a community manager who is one of those “embedded” within the news room and areas such as CiF, works to reduce the need for moderation by encouraging a healthy community of moderators. Oliver sees her role as to represent and be the “voice of the reader”, encouraging a “two-way conversation” and broadening the overage. Once a story is published, that’s not the end of it as that’s where the readers come in. The Guardian wants to build a returning community, Oliver said, beyond asking readers to “send in pictures of snow”. She gave the example of ensuring the team “connected” with those contributing from North Africa during the height of the uprisings and ensuring those commentators “would come back to us”. She also highlighted the collaboration from readers and expert commentators during the daily blog on the Health and Social Care Bill, run during the debate around the amendments to the bill, the pause and its passage through parliament. Claire Armitstead, literary editor of the Guardian, talked about crowdsourcing and call outs for reader responses and how they influence the sections such as Books. What this new journalism has opened up is new ways of responding to criticism within the arts. Dan Roberts, national editor of the Guardian, the chair of the debate, explained how his team started trying to capture witnesses to events, harnessing citizen journalists, and has evolved into opening up to publishing the daily newslist. The idea is that publishing the list encourages feedback, Roberts said, “in the hope we get some advice and help”. That way we know that we are chasing the things that readers care about. This entry was posted in Comment, Online Journalism and tagged online communities, The Guardian on March 25, 2012 by Sarah Marshall. The Guardian has launched Streetstories, an iPhone and Android app, providing audio stories based on the phone’s location. The app is another Guardian project focusing on social, local mobile and is launched the day after the public release of n0tice, another move by the news organisation into the SoLoMo space. Launched ahead of the Guardian’s Open Weekend event this weekend, the Streetstories app provides a guide to King’s Cross,the area of London where King’s Place, the Guardian building where the event will take place, is located. Francesca Panetta, the app’s creator, has blogged about it. This entry was posted in Mobile and tagged Francesca Panetta, geolocation, Hyperlocal, King's Cross, King's Place, Streetstories, The Guardian on March 21, 2012 by Sarah Marshall. The Guardian’s latest venture into hyperlocal publishing is now open to all with the “full open release” of n0tice. Matt McAlister, director of digital strategy for the Guardian Media Group, presented the social, local, mobile offering at today’s Changing Media Summit. 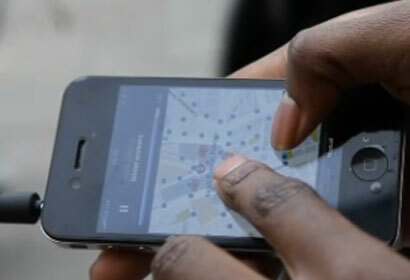 The seed of the idea came out of a Guardian Hack Day project inspired by geolocation services. If the phone knows where you are and if I see something interesting around me, why can’t I report on that and be an active citizen journalist or participant? The team evolved the idea into “a community service explicitly tied to a location, almost as a navigation or a filter for finding information”. Since accepting members by invitation only, early users have been influencing its development. The platform has opportunities for hyperlocal news sites, which can brand a noticeboard, tracking interaction using web analytics. Some hyperlocals have adopted n0tice as “their events database, essentially submitting events directly onto notice but with their brand and look and feel”. McAlister explained that it can increase engagement for hyperlocals. WordPress is a wonderful publishing environment but it’s not as good as crowdsourcing reports. You can get someone to comment on something you’ve written but it’s not as good for letting anyone share anything original directly into a community space. The platform also has wider opportunities for hyperlocals and other users: they can potentially make money by creating a noticeboard. Based on a classifieds system with users paying for premium ads, noticeboard owners keep 85 per cent of the revenue generated. This entry was posted in Hyperlocal, Mobile and tagged Hyperlocal, Matt McAlister, n0tice, Technology/Internet, The Guardian on March 21, 2012 by Sarah Marshall. Today the Guardian reports that ITV is under investigation by broadcast regulator Ofcom after news reporter Richard Pallot called black footballers “coloured” – while reporting on a racism in football summit held at No.10 Downing Street. ITV News apologised shortly after the broadcast on its Twitter page and the word has been removed from all future catchup editions of the broadcast, including an edited clip on the ITV News website. 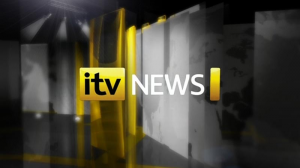 The ITN-produced programme is now investigating how the pre-recorded report that included the word was allowed to be broadcast. This entry was posted in Broadcasting, Editors' pick, Journalism and tagged ITV, Ofcom, richard pallot, The Guardian on March 5, 2012 by Gaz Corfield. 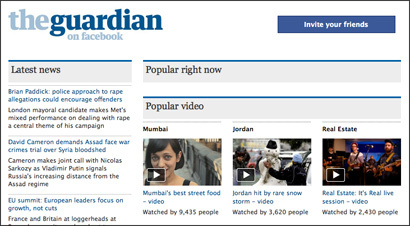 The Guardian has 3.9 million monthly active users, over half of whom are under 25. Facebook has today published a “spotlight” on the Guardian’s app on its developer blog. The app has had more than six million installs, suggesting that more than half of those who have opted in use it regularly. The Guardian’s app, which launched at September’s Facebook f8 conference, encourages “frictionless sharing” and those who opt in to the app to allow their Facebook friends to see what they are reading. Less than two months after the Guardian’s app was released, the news outlet said the app was delivering an additional one million hits per day. As well as encouraging younger readers, the Guardian’s app is also giving older content a new lease of life, as Martin Belam, one of those working on the app at the Guardian explains in this blog post. This entry was posted in Social media and blogging and tagged app, Facebook, The Guardian on March 2, 2012 by Sarah Marshall.